This set is now available for the holidays, and I think it makes a great gift. It has all the basic colors that you would wear around this time of year. My favorite has to be Wanna Samba? this is a great color-shifting grey. 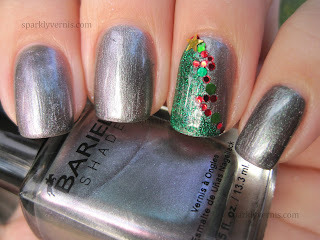 Holiday Madness is very similar to Chanel Peridot, but this one lacks the color shift to blue. I loved the formula on this one, better than the Chanel. Jillian's Jammin' looked promising on the bottle and the formula is ok, but it is very sheer. I did 4 coats, probably could have gotten away with three, but still. Rio's Rockin' Band is a pretty pink, although it leans to purple on the photos. I loved the red one too, Lindsay's Dancin', it is really gorgeous. Again, the formula was perfect, applied really smooth and for a red, it was a breeze to remove. Overall, the formula of the collection is consistent with other Barielles I've tried; and they dry really fast. 2 coats Barielle Wanna Samba?